On the night before Valentine’s Day, Kevin Owens broke everybody’s heart. It’s a moment we’ll never forget, and the best wrestling angle in years. 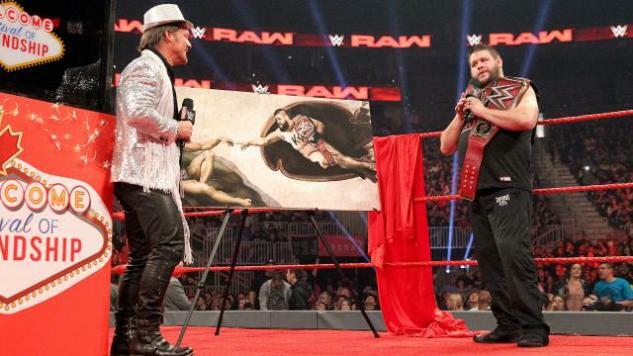 WWE heavily promoted last night’s episode of Raw as a “Festival of Friendship” between Chris Jericho and Kevin Owens. Their close on-screen relationship was transparently passive-aggressive and disingenuous when it started last year, but over the months, as they’ve weathered numerous setbacks and celebrated occasional successes, the two seemed to genuinely start to like each other. Owens could still seem a little stand-offish when Jericho indulged his flashier instincts, but at the end of the day they were always there for each other. And it paid off, too: Owens is the WWE Universal Champion, and Jericho won the United States Championship from Roman Reigns in January. With Owens set to face his toughest test yet in the form of Goldberg at the upcoming Fastlane pay-per-view, and perhaps as a form of penance for committing Owens to that match in the first place, Jericho wanted to celebrate their friendship for all the world to see, and last night’s Festival of Friendship was the result. This is wrestling, though. Friendships never last. Ricky Morton turned on Robert Gibson. Sting and Lex Luger feuded often throughout the years. Shawn Michaels infamously threw Marty Jannetty through Brutus “the Barber” Beefcake’s window on WWF Wrestling Challenge. Savvy wrestling fans knew it was only a matter of time before Owens and Jericho turned on each other, but few probably expected the WWE of today to pull it off so perfectly. There are a lot of reasons that this entire angle worked so well. Primary among them is Jericho’s continued excellence as a performer. He’s been one of the best promos and actors in wrestling for twenty years, but last night might have been his best performance ever. Schmaltz often doesn’t mesh well with pro wrestling, but it fits Jericho’s “cool dad” showman persona to a tee. Everybody in that arena and watching at home truly believes that Jericho is the kind of guy who’d wear a silver sequined vest and fedora to Vegas, who’d dance down the aisle arm-in-arm with showgirls, who’d commission a riff on Michelangelo’s The Creation of Adam that swaps himself and his best friend in for Adam and God. We can accept these outlandish elements because they make perfect sense for the character. Combine that with Jericho’s reliably crisp delivery, and his almost unparalleled ability to read a crowd and milk his own catchphrases for every possible drop, and you have the rare WWE comedy segment that flows effortlessly from the skills and character of the talent involved. Owens, of course, is no slouch himself when it comes to acting and telling a story. His deep reluctance to participate in Jericho’s shenanigans was tempered with what felt like genuine fondness for his friend. He’s clearly never on board with Jericho’s act, but for the first 15 or so minutes he tries to not be too mean about it. It’s only after Jericho’s awkward gifts pile up, from the bad art to the Craigslist magician to the unclamored-for return of Gillberg, that Owens starts to seem legitimately upset with his friend. As the less demonstrative, more serious, and more insincere of the two, Owens reacted exactly as we’d expect him to. The true beauty of this angle, though, and the reason we’ll remember it for as long we watch wrestling, comes in the final few minutes. After Owens finally has enough and complains about the Festival of Friendship, telling Jericho that he thought it was all just a ruse to lure Goldberg into an ambush, Jericho gets serious and delivers a heartfelt speech about how his friendship with Owens has made the last year the best of his career. Whatever insincerity we used to read in Jericho’s interactions with Owens are immediately forgotten as Jericho seems to stop acting for a moment and share his true feelings with his best friend. Even Owens is touched, and reveals that he has a gift for Jericho, too, although nothing as elaborate as what Jericho prepared for him. The final grace note of this entire segment comes in the reveal of Owens’s gift, from how it’s shot, to how Jericho and Owens play it out. Jericho opens the gift from Owens, and is touched to see it’s a new list. (Part of Jericho’s current character is that he puts anybody who wrongs him on the List of Jericho. It’s goofy but he makes it work.) Jericho beams as he lifts the list out of the box, hoisting it up so the fans at home and in the arena can see the backside emblazoned with the words “the List of KO.” As soon as the fans realize what that means, the camera closes in on Jericho’s face as it slowly turns from pride to worry, as he earnestly asks his best friend why the only name on the new list is Jericho’s. Owens, his face steely and grim, drops his mic, the sound of it hitting the ring confirming what the camera doesn’t need to catch, and then he lights upon his friend with a flurry of blows. Owens brutalizes Jericho throughout the ring and beyond, powerbombing him on the apron, and, in a call-back to Michaels and Jannetty, throwing him face-first through the glass screen of the Jeritron HD TV set up in the ring. Before that final blow, Owens holds the battered Jericho up and screams “I hate you!” directly into his face. It was brutal, depressing, and exactly the kind of shot-in-the-arm that WWE needs in what’s been a lackluster build-up to Wrestlemania. Wrestling used to be built on moments like this, moments where the wrestlers seemed like real people with real emotions, real problems and real relationships. The heavily scripted nature of WWE today, along with the inexplicable dragging out of what should be simple storylines (remember how many times Damian Mizdow seemed to turn on the Miz? ), and a roster full of performers who only know the WWE system and can’t read the audience, has made it really hard for anything to truly resonate with the fans. Wrestling might not be real, but it’s supposed to feel that way, and it too rarely does in the modern WWE. Last night Jericho and Owens, already the best thing about Raw, injected what could’ve been a rambling, twenty-minute segment full of bad comedy with more legitimate emotion from across the entire emotional spectrum than WWE has seen in years. They showed us all how great wrestling can be by reminding us of how great wrestling once was. If you missed it, WWE has put three clips from the segment up on YouTube. You can watch those below, but you really need to go out of your way to watch the entire unedited broadcast, complete with commercial breaks. (Yes, Jericho incorporates the commercial break into one of his catchphrases. It’s awesome.) If you’re a lapsed fan who’s lost interest in wrestling because it feels too canned and not as realistic as the stuff you grew up with (which, to be honest, if you only grew up with WWE or WWF, you probably have no idea what I’m even talking about when I talk about realism), this angle might reawaken some of your dormant love for the business. Either way, it’s something all wrestling fans, former and current, should watch. Garrett Martin edits Paste’s wrestling, games and comedy sections. He’s on Twitter @grmartin.